An oasis of nature in the heart of the city. This beautiful natural setting lies just northwest of Vancouver International Airport. It overlooks Vancouver Island to the west and Vancouver to the north. Trails here are beachside or are sandy and unmarked. The beach is long, rugged, and sits in the midst of the Pacific Flyway, making it a hub for thousands of migratory birds. There’s also a 4-kilometre (2.5 mile) jetty with a walkway extending out into the Strait of Georgia—a great place to go plane spotting. 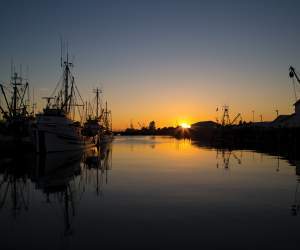 This scenic park is a short walk from central Steveston and offers a breathtaking place to watch the sunset, with spectacular views of the South Arm of the Fraser River and Gulf Islands. Plenty of open-grass areas for picnicking and kite-flying give way to pathways like the West Dyke Trail, which stretches all the way to Terra Nova Rural Park. Garry Point Park is also home to Kuno Garden, a beautiful Japanese-style memorial garden. Four walking trails totaling over 5 kilometres (3 miles) wind their way through 81 hectares (200 acres) of raised peat bog, allowing good opportunities to view a spectrum of plants and animals in their natural habitat. Each season brings with it something new, like owls in the autumn and hummingbirds in the spring. Open daily is the park’s Nature House, an interpretive centre featuring displays, a working beehive, and a gift shop. This must-visit for nature lovers features extraordinary views of the Strait of Georgia, Fraser River, and North Shore Mountains. Here, you can enjoy excellent bird-watching, the observation platform, and a meal at the picnic tables while you relax. It’s also home to the Terra Nova Adventure Play Environment, a million-dollar playground incorporating sustainable design practices designed to mimic nature. It features a tandem zipline and a 10-metre (about 33 ft.) tall treehouse. This oasis in the heart of central Richmond features meandering walking routes along ponds, waterfalls, floral displays, and a variety of trees. Look for Minoru Chapel, one of Richmond’s first churches, originally built in 1891 and moved to its present location for preservation in 1967. The park is also close to the Minoru Aquatic Centre, Richmond Library and Cultural Centre, Minoru Arenas, Latrace Baseball Diamond, and the Clement Track. One of the city’s most unique parks, Larry Berg Flight Path Park can be found just beyond the perimeter fence at the end of Vancouver International Airport’s south runway. It’s the perfect place to do some plane spotting, and there are plenty of kid-friendly features such as paved mini-runways, a dome-shaped globe to climb on, and benches shaped like paper airplanes. This picnic spot is also dog-friendly, with a spacious off-leash area that’s perfect for romps along the beach. The park’s trails allow for leisurely strolls along the water, where you’ll see plenty of working ships and log booms. You’ll also see nice views of south Vancouver across the Fraser River. And it’s a great spot to watch planes taking off and landing or boats using the park’s boat launch. Here, you’ll find the Arboretum, a collection of over 100 species of trees from around the Pacific Rim planted within a 2-acre area. Aside from the walking trails through this beautiful canopy, you’ll find a popular playground which was partially designed and built by kids aged 5 to 16. Explore more of Richmond’s parks on the City of Richmond’s website. Explore Richmond's scenic trails by bike. Over 80 kilometres (50 miles) of exploration. There are plenty of places to cast a reel in Richmond. Tee off at Richmond's golf courses.